In the morning you depart from you hotel in Bangkok by local transport. Your destination for today is Bangrak. Bang means village and Rak means love, so this area is also called the love district. After a short walk, you will stop at the first restaurant. It’s famous because of the roasted duck, and of course you can try some. Afterwards, you will pass a local fruit market, and take some fruit. Then you walk to a Buddhist temple of 200 years old. The temple is recently renovated and there’s a small reclining Buddha inside. Your next stop is Muslim restaurant, established in 1938. The first generation is still working at the restaurant. The guide will order beef satay with peanut sauce, roti, curry with egg (lava egg) and delicious fish. After passing the Catholic Assumption Church and the luxurious Mandarin Oriental Hotel, you will take a river boat to cross the Chao Praya River. 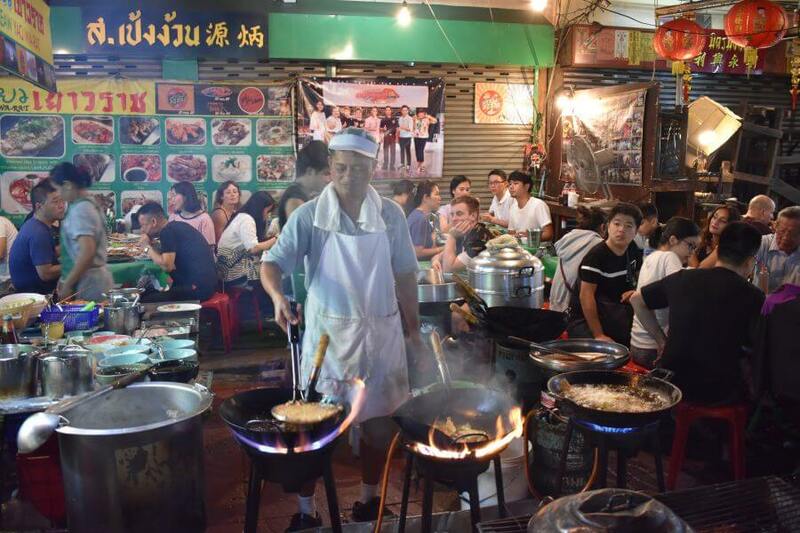 On the Thonburi side of Bangkok, it’s time to try some traditional som tam and deep fried catfish, also known as papaya salad. You will go back by river boat and have a coffee or juice with a typical Thai dessert at Panlee Bakery. Afterwards back to your hotel in Bangkok by local transport.